To my understanding of his reply, i think he was say that he hasn't heard of a single report concerning the Pro 100 with any Firmware update. Thanks for the update. That's my take as well, that he hasn't heard of any firmware causing an issue with refilling. That is the forum's experience as well AFAIK. 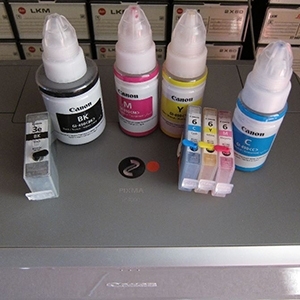 Are you aware of the issues surrounding refilling the CLI-42 Yellow cartridge? Our moderator The Hat has some good advice on this. Yes im aware of the yellow gello effect of the the yellow cartridge. Thanks to @The Hat and many members on this site, I now know the procedure of how to deal with the tenacious yellow 42 cartridge. Jose Rodriguez on YouTube explain the process and many other aspects to the printing Hobby extremely well.